The U.S. Travel Association on Tuesday released its inaugural Travel Trends Index (TTI), a two-prong indicator developed by the organization’s economic research team to both track and predict the volume and pace of travel to and within the U.S. The TTI will be released on the first Tuesday of each month. 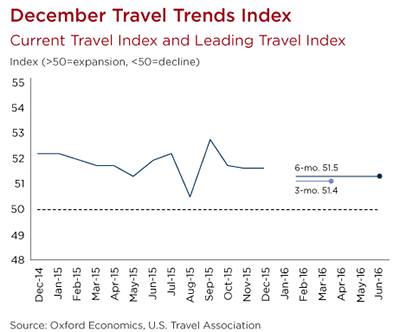 This month’s TTI—which measures travel trends as of December 2015—shows that travel growth leveled off at the end of the year and forecasts moderate growth in early 2016. Inbound international travel, while still on a slight growth trajectory, has leveled off considerably due to the strong U.S. dollar. The TTI assigns a numeric score to every travel segment it examines—domestic and international, leisure and business—in current, 3-month predictive and 6-month predictive indicators. As with many indices similarly measuring industry performance, a score above 50 indicates growth, and a score below indicates contraction. The TTI draws from multiple data sources to develop a monthly reading of both international inbound and domestic business and leisure travel numbers, and predict the likely average pace and direction of these travelers over upcoming three and six month periods. The TTI consists of the Current Travel Index (CTI), which measures the number of person trips involving hotel stays and/or flights each month, and the Leading Travel Index (LTI), which measures the likely average pace and direction of business and leisure travel, both domestic and international inbound. Hotel room demand data from STR.